This article is about the breed of cat. For the legendary creature, see Sphinx. For other uses, see Sphynx (disambiguation). The Sphynx cat is a breed of cat known for its lack of coat (fur). It was developed through selective breeding, starting in the 1960s. The skin should have the texture of chamois, as it has fine hairs, or they may be completely hairless. Whiskers may be present, either whole or broken, or may be totally absent. They also have a narrow, long head, and webbed feet. Their skin is the color that their fur would be, and all the usual cat markings (solid, point, van, tabby, tortie, etc.) may be found on the Sphynx cat's skin. Because they have no coat, they lose more body heat than coated cats. This makes them warm to the touch as well as heat-seeking. A male purebred Sphynx in the "mink" pattern. Like a pointed cat, the mink pattern also exhibits darker points: the ears, tips of tail, feet and nose. However, whereas the pointed pattern is entirely colorless everywhere else on the body, the mink coloration has some color throughout the body and just slightly darker points in adulthood. The mink pattern can be combined with any color. Although hairless cats have been reported throughout history, breeders in Europe have been working on the Sphynx breed since the early 1960s. Two different sets of hairless felines discovered in North America in the 1970s provided the foundation cats for what was shaped into the existing Sphynx breed. The contemporary breed of Sphynx cat, also known as the Canadian Sphynx, is distinct from the Russian hairless cat breeds like Peterbald and Donskoy. The Canadian Sphynx breed was started in 1966 in Toronto when a hairless kitten named Prune was born to a black and white domestic shorthair queen (Elizabeth). The kitten was mated with its mother (something called backcrossing), which produced one more naked kitten. 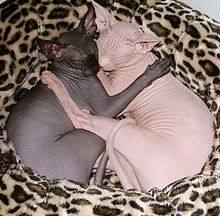 Together with a few naked kittens found later, the cat Prune marked the first attempt to create a hairless breed. After purchasing these cats in 1966 and initially referring to them as "Moonstones" and "Canadian Hairless," Ridyadh Bawa, a science graduate of the University of Toronto, combined efforts with his mother Yania, a long time Siamese breeder, and Kees and Rita Tenhoves to develop a breed of cats which was subsequently renamed as "Sphynx". The Bawas and the Tenhoves were the first individuals able to determine the autosomal recessive nature of the Sphynx gene for hairlessness while also being successful in transforming this knowledge into a successful breeding program with kittens which were eventually capable of reproducing. The Tenhoves were initially able to get the new breed provisional showing status through the Cat Fanciers' Association (CFA) but ultimately had the status revoked in 1971, when it was felt by the CFA Board that the breed had concerns over fertility. The first breeders had rather vague ideas about Sphynx genetics and faced a number of problems, the genetic pool was very limited and many kittens died. There was also a problem with many of the females suffering convulsions. In 1978, cat breeder Shirley Smith of Ontario, Canada, found three hairless kittens on the streets of her neighborhood. In 1983 she sent two of them to Dr. Hugo Hernandez in the Netherlands to bred the two kittens, named Punkie and Paloma, to a white Devon Rex named Curare van Jetrophin. The resulting litter produced five kittens, two males from this litter (Q. Ramses and Q. Ra) were used, along with Punkie’s half-sister, Paloma. 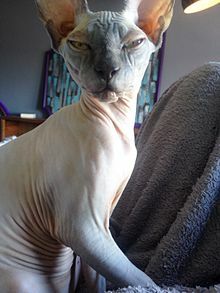 The first noted naturally occurring foundation Sphynx originated as hairless stray barn cats in Wadena, Minnesota, at the farm of Milt and Ethelyn Pearson. The Pearson's identified hairless kittens occurring in several litters of their Domestic Shorthair (DSH) barn cats in the mid-1970s. Two hairless female kittens born in 1975 and 1976, Epidermis and Dermis, both cats were sold to Oregon breeder Kim Mueske and became an important part of the Sphynx breeding program. Also worked with the Pearson line of cats was breeder Georgiana Gattenby of Brainerd, Minnesota who outcrossed with Cornish Rex cats. Other hairless breeds might have body shapes or temperaments that differ from those described above. There are, for example, new hairless breeds, including the Don Sphynx and the Peterbald from Russia, which arose from their own spontaneous mutations. The standard for the Sphynx differs between cat associations such as The International Cat Association (TICA), Fédération Internationale Féline (FIFE) and Cat Fanciers' Association (CFA). In 2010, DNA analysis confirmed that Sphynx hairlessness was produced by an allele of the same gene that produces the Devon Rex (re), with the Sphynx allele being incompletely dominant over the Devon allele and both recessive to the wild type. However a different genetic symbol (hr) is given to the Sphynx gene and it is more likely that these are different genes interacting with each other. The only allowable outcross breeds in the CFA are now the American Shorthair and Domestic Shorthair. Other associations may vary and the Russian Blue is a permitted outcross in the Governing Council of the Cat Fancy (GCCF). In Europe, mainly Devon Rex has been used for outcrosses. Though Sphynx cats lack a coat to shed or groom, they are not maintenance-free. Body oils, which would normally be absorbed by the hair, tend to build up on the skin. As a result, regular bathing is usually necessary weekly or bi-weekly. Care should be taken to limit the Sphynx cat's exposure to outdoor sunlight at length, as they can develop sunburn and skin damage similar to that of humans. In general, Sphynx cats should never be allowed outdoors unattended, as they have limited means to conserve body heat when it is cold. In some climates, owners provide coats or other clothing in the winter to help them conserve body heat. While they lack much of the fur of other cat breeds, Sphynxes are not necessarily hypoallergenic. Allergies to cats are triggered by a protein called Fel d1, not cat hair itself. Fel d1 is a protein primarily found in cat saliva and sebaceous glands. Those with cat allergies may react worse to direct contact with Sphynx cats than other breeds; even though reports exist that some people with allergies successfully tolerate Sphynx cats, they are fewer than those who have allergic reactions, according to David Rosenstreich, MD, the director of the Division of Allergy and Immunology at the Albert Einstein College of Medicine and Montefiore Medical Center in the Bronx, New York City, New York. These positive reports may be cases of desensitizing, wherein the "hairless" cat gave the owner optimism to try to own a cat, eventually leading to the positive situation of their own adaptation. Sphynx cats can also have more ear wax than most hairy domestic cats because they have little to no hair in their ears to catch and protect them from a build up of impurities in their ears, like dirt, skin oils (sebum), and ear wax which accumulates more frequently in the hairless sphynx breed. The Sphynx cat's ears will need to be cleaned on a weekly basis, usually before bath time. The Sphynx breed also tends to accumulate oils and debris under their nails as well as the skin fold above the nail due to the lack of fur, so, like the ears, the nails and surrounding skin folds need to be cleaned properly as well. Due to these factors the breed may require more grooming than a typical domestic cat with fur. Specialty products for this cat have been developed, though they still require more grooming than most breeds. The Canadian Sphynx face challenges unique to their nature. Because of their lack of protective fur, skin cancer may be a problem if exposed to sunlight for long durations of time. The lack of hair can cause health issues with kittens in the first weeks of life because of susceptibility to respiratory infections. Reputable breeders should not let their kittens go to new homes without being at least 14 weeks of age to ensure the kitten is mature enough to cope in a new environment. The breed does have instances of the genetic disorder hypertrophic cardiomyopathy (HCM). Studies are being undertaken to understand the links in breeding and the disorder. The Sphynx cat has a high rate of heart disease, either HCM or mitral valve dysplasia. In a study of 114 cats, 34% were found to have an abnormal heart. 16 had mitral valve dysplasia and 23 had HCM. These prevalences were found in cats with an average age of 2.62 years. A type of muscular dystrophy associated with alpha-dystroglycan deficiency, and similar to that seen in Devon Rex cats, has also been described, but is rarely seen. 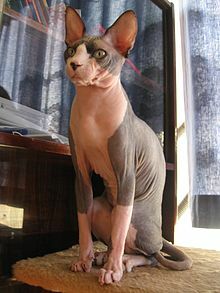 The Sphynx hairlessness is produced by the same gene as the Devon Rex phenotype. Moreover, it was found that the curly coat of Selkirk Rex cats is also associated with this gene. In detail the gene encodes Keratin 71 (KRT71) and is responsible for the keratinization of the hair follicle. The Sphynx mutation leads to a complete loss-of-function where the structure of the hair is damaged so that i.e. the hair can be formed but is easily dislodged. In the Devon Rex mutation a residual activity of the protein still exists. The Selkirk Rex allele (sadr) is dominant over the wild type gene, which is dominant over the Devon Rex allele (re) and the Sphynx (hr) which forms an allelic series of : KRT71SADRE > KRT71+ > KRT71re > KRT71hr. ^ a b "TICA Sphynx breed standards" (PDF). TICA.org. The International Cat Association. Retrieved 2014-06-22. ^ "Cat Fanciers Association Sphynx Breeding Standards" (PDF). cfa.org. The Cat Fanciers' Association. Retrieved 2016-12-04. ^ "Cat Breed Profile :: Sphynx". animal.discovery.com. Animal Planet (Discovery Communications). 2008-09-10. Retrieved 2010-10-26. ^ a b c d "Prestigious Sphynx cats once considered 'feral' breed". Wadena Pioneer Journal. January 21, 2012. Retrieved 2018-05-23. ^ "Sphynx Cat History". BeeblebroxSphynx.com. Retrieved 2010-11-17. ^ a b c "Sphynx Cat Breed-History, Appearance & Temperament". Cat World. April 4, 2018. Retrieved 2018-05-23. ^ a b c d "Sphynx Cat, history". Petfinder.com. Retrieved 2018-05-23. ^ Gandolfi, Barbara; Outerbridge, Catherine A.; Beresford, Leslie G.; Myers, Jeffrey A.; Pimentel, Monica; Alhaddad, Hasan; Grahn, Jennifer C.; Grahn, Robert A.; Lyons, Leslie A. (October 2010). "The naked truth: Sphynx and Devon Rex cat breed mutations in KRT71". Mammalian Genome. 21 (9–10): 509–515. doi:10.1007/s00335-010-9290-6. ISSN 0938-8990. PMC 2974189. PMID 20953787. ^ "Sphynx". CFA.org. The Cat Fanciers' Association. 2010-07-04. Retrieved 2010-10-26. ^ "Sphynx Cat Wear – clothes for Sphynx cats". sphynxcatwear.com. ^ "The Big Question, What about allergies?". Ankhamun.com. Archived from the original on July 18, 2011. Retrieved February 9, 2017. ^ "Cleaning Sphynx Cat's ears". Sphynxlair.com. Retrieved 2010-10-26. ^ "Clipping your Sphynx cat nails". Sphynxlair.com. Retrieved 2010-10-26. ^ "Breed Profile: The Sphynx". Cat Fanciers Association (CFA). Retrieved 2018-09-13. ^ Irvine, Angela; Trevor, Dawes; McAuliffe, Michael; Bowd, Neil (2006). Sphynx: The Australian Experience. OzSphynx. p. 14. ISBN 9780646473093. ^ "Sphynx HCM Research". North Carolina State University school of veterinary medicine. Retrieved 2013-02-01. ^ Chetboul, V.; Petit, A.; Gouni, V.; Trehiou-Sechi, E.; Misbach, C.; Balouka, D.; Carlos Sampedrano, C.; Pouchelon, J. L.; Tissier, R.; Abitbol, M. (December 2012). "Prospective echocardiographic and tissue Doppler screening of a large Sphynx cat population: Reference ranges, heart disease prevalence and genetic aspects". Journal of Veterinary Cardiology. 14 (4): 497–509. doi:10.1016/j.jvc.2012.08.001. PMID 23131204. ^ Martin, P. T.; et al. (2008). "Muscular dystrophy associated alpha-dystroglycan deficiency in Sphynx and Devon Rex cat". Neuromuscular Disorders. 12. 18 (12): 942–52. doi:10.1016/j.nmd.2008.08.002. PMC 2646259. PMID 18990577. ^ a b Gandolfi, B.; Alhaddad, H.; Joslin, S. E.; Khan, R.; Filler, S.; Brem, G.; Lyons, L. A. (2000). "A splice variant in KRT71 is associated with curly coat phenotype of Selkirk Rex cats". Scientific Reports. 3: 2000. doi:10.1038/srep02000. PMC 3683669. PMID 23770706. ^ Gandolfi, B.; Outerbridge, C. A.; Beresford, L. G.; Myers, J. A.; Pimentel, M.; Alhaddad, H.; Grahn, J. C.; Grahn, R. A.; Lyons, L. A. (October 2010). "The naked truth: Sphynx and Devon Rex cat breed mutations in KRT71". Mammalian Genome. 21 (9–10): 509–515. doi:10.1007/s00335-010-9290-6. PMC 2974189. PMID 20953787. Wikimedia Commons has media related to Sphynx (cat).